I’m excited to kick off the New Year with a new room design for you today! If you’ve been following Design Improvised for awhile you may know that in addition to my DIY projects, I love the opportunity to create the occasional room design! My latest project was for a client looking to transition her formal dining room into a playroom for her 14 month daughter and another daughter on the way. 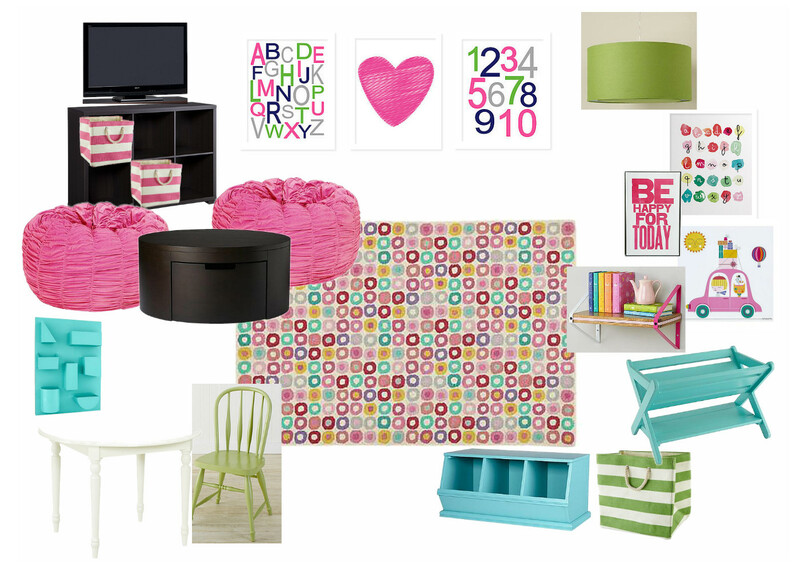 It was a fun project to work on as my client shared my love for bright pops of color and all things The Land of Nod! It was also a good challenge, as in addition to designing a girly playroom for her two daughters under 2, she wanted it to be a space where her three older children (ranging in age from 8 to 13) could hang out occasionally and play games and watch TV. The playroom includes a variety of storage pieces from a circular storage table that can serve as a surface for playing board games, to baskets and bins, and wall storage pieces. I created a TV zone with large bean bags that the older children could sit in, an art corner with a play table, and a comfy rug to play on. More room designs coming soon, and an exciting announcement later this week, so stay tuned!